﻿BLUE STAR PEST CONTROL﻿ was founded by Mr. John Brown in April of 1984, from that time to 1996, Blue Star Pest Control secured a modest yet solid foothold in the pest control industry in St. Tammany parish. Blue Star Pest Control started doing business in Orleans and Jefferson parishes in the later years. In 1996, in light of the industries struggle with ineffective termite chemicals and the increase in lawsuits within our industry, Mr. Brown decided to sell his accounts to a major pest control company, believing it was the right thing to do for his loyal customers to stay protected. Many Blue Star customers were very upset that their accounts had been sold to another company. 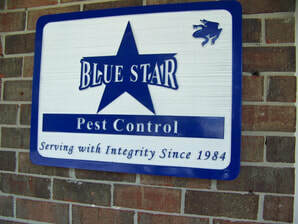 It was that fact and the many requests from customers that led Mr. Brown to re-open Blue Star Pest Control in 2001. Mr. Brown re-started the operation with no customer base, and began to re-build Blue Star Pest Control from scratch. Even to this day, many of our previous customers are grateful that we re-opened and are returning to have us protect their homes. In 2002, Mr. Brown had a heart attack, which slowed him down tremendously. He attempted to continue building Blue Star Pest Control for another year after his heart attack, but he realized that without the proper personnel, this venture would be difficult if not impossible. In September of 2003, Mr. Brown happened to unexpectedly cross paths with Mr. Armando V. Ruiz, Sr. president of RNR Enterprise, Inc. Mr. Brown knew he did not want the Blue Star name to go away, but he also knew he could not bring the company to the level that he would hope for, due to his current situation. Mr. Brown was able to see that RNR Enterprise, Inc. was backed by the energy, stamina, and successful track record in customer service that he knew Blue Star Pest Control needed to be rebuilt. In November of 2003 Blue Star Pest Control was sold to RNR Enterprise, Inc. with the commitment from the president to bring Blue Star Pest Control back to its previous success and beyond. ​Blue Star Pest Control currently services customers in nineteen (19) parishes in the State of Louisiana and we are growing. We have serviced thousands of customers in our community and continue to service like no other by dedicating ourselves to Protecting Families from unwanted pest, that has always been our focus. This focus has served us well in the past and will continue to do so for many years to come. "OUR WORD IS OUR BOND"
We have served our community with integrity and honesty over the years. This is what sets us apart from the rest. We want our customers to rest assured that their families and their property are protected from pests.